M Mushtaque, M Younis, M Thoker. 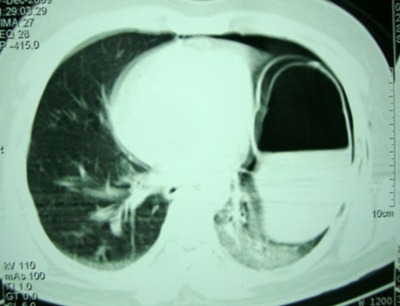 Traumatic Isolated Pericardio-Diaphragmatic Rupture. The Internet Journal of Surgery. 2009 Volume 26 Number 1. Pericardio-diaphragmatic rupture (PDR) is an uncommon injury, most frequently caused by high-velocity trauma, that can pose a diagnostic challenge to surgeons. We report a case of blunt traumatic PDR in a 35-year-old male who did not have any associated visceral injury. There was a 10cm rent in the left hemidiaphagm extending medially to involve the pericardio-diaphragmatic junction with uninjured heart and uninjured other visceral organs in the chest or abdomen. The stomach was partially herniated into the thorax and was easily pulled out at laparotomy, revealing the cardiac apex at the medial edge of the ruptured diaphragm. The rent was repaired with interrupted silk sutures and a left-sided intercostal chest tube was put in, which was removed two days before the patient was discharged on the 7th postoperative day. There were no complaints on follow-up. Traumatic diaphragmatic rupture (TDR) occurs in 0-5% of patients with major blunt thoraco-abdominal trauma, in most of them on the left side, and an early correct diagnosis is made in less than half of the cases[1,2]. The incidence of additional injured viscera in TDR is about 90-95%. Pericardio-diaphragmatic rupture (PDR) is an uncommon problem that poses a diagnostic challenge to surgeons. The incidence of PDR is between 0.2% and 3.3% of cases with TDR[ 4 ]. We report a rare case of traumatic PDR without any associated visceral injury . A 35-year-old male passenger underwent a road traffic accident and was brought to casualty, complaining of pain in the left upper abdomen. The patient was hemodynamically stable . Abdominal examination revealed abrasion over the left iliac region, mild diffuse tenderness, guarding without rigidity or rebound, with decreased bowel sounds. On chest examination, movements were decreased over the left chest and breath sounds were decreased in lower and mid lung zones. There was no obvious bony fracture or subcutaneous emphysema. Cardiac examination was normal with regular rate and rhythm and without any added sounds. 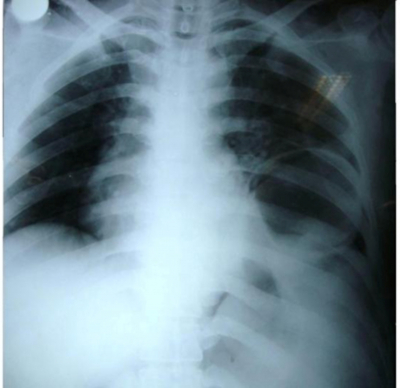 Chest x-ray revealed an elevated left hemidiaphagm with a smooth contour and a well defined radiolucent shadow in the left chest above the diaphragm along with adjacent plate-like atelectasis (figure 1). CECT of the chest confirmed diaphragmatic rupture with partial herniation of stomach into left chest (figures 2 and 3). Abdominal CECT revealed a mild amount of free fluid without any hollow or solid visceral injury (figure 4). The patient was operated two hours after the trauma and a laparotomy was made. Intraoperative findings included about 100ml of blood-stained free fluid, a 10cm rent in the left hemidiaphagm (figure 5) extending medially to involve 2cm of the pericardio-diaphragmatic junction with uninjured heart and uninjured other visceral organs in the chest or abdomen. The partially herniated stomach was easily pulled out and the rupture was repaired with interrupted silk sutures. A left-sided intercostal chest tube drain was put in, which was removed two days before the patient was discharged on the seventh day. The patient had no complaints on follow-up. Figures 2 and 3: CECT of the chest confirming diaphragmatic rupture with partial herniation of stomach into left chest. PDR is a rare clinical finding[ 4-6 ] but should be suspected in case of severe thoraco-abdominal trauma. The first case report on a patient diagnosed with PDR preoperatively was published in 1951[7 ] and on average, only one case of PDR is published annually. Motor vehicle accident is the cause in 80% of cases while 17% are due to falls. The rent in the pericardium might be situated in 3 regions[ 6, 8 ], the diaphragmatic, superior mediastinal, and left or right pleuropericardial regions. The commonest location of a tear[ 9 ] is the left pleuropericardium (62%), followed by the diaphragmatic portion of the pericardium (22%). Right diaphragmatic rupture is less common due to buffering by the liver[ 10 ] .The strong central tendon of the diaphragm is very rarely injured[ 4 ]. In our case, the cause of rupture was a motor vehicle accident and the rent was in the left hemidiaphagm, extending medially to involve 2 cm of the pericardio-diaphragmatic junction with uninjured heart and uninjured other visceral organs in the chest or abdomen. If diaphragmatic pericardium and diaphragm are ruptured simultaneously, the abdominal contents might herniate into the pericardial sac and cause respiratory distress, cardiac compression and cardiogenic shock[ 4 ], which was not seen in our case. Many investigations have been described for diagnosis of TDR, including chest x-ray , CT scan, MRI, upper GI contrast study, USG, thoracoscopy and laparoscopy. Despite technical limitations, chest x-ray is the first step for detection of diaphragmatic rupture. According to literature, initial radiographs allow diagnosis of 27-60% of left-sided and only 17% of right-sided injuries[ 12 ]. The finding of bowel or stomach above the diaphragm with focal constriction at the site of injury is diagnostic of TDR. Other non-specific findings on chest x-ray include elevation and/or indistinct margins of the diaphragm, pleural effusion, atelectasis and contralateral mediastinal shift. 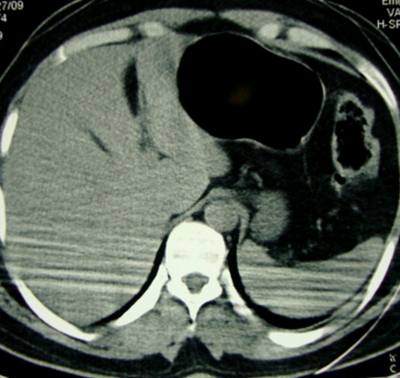 The CT findings of diaphragmatic rupture include discontinuity of the diaphragm (gap sign), an abnormally thickened diaphragmatic crus, herniation of stomach, bowel or solid organs into the chest and the collar sign. In patients with PDR, an abnormal air shadow in the cardiac area on chest x-ray or presence of an air fluid level anterior to the heart on lower chest CT scan is diagnostic[2,4,13]. MRI and upper GI contrast studies have also been used to diagnose TDR while echocardiography may help in differentiating simple PDR from pericardial tamponade (with or without PDR ). In our case, the diagnosis of TDR was made by chest x-ray and CECT of chest and abdomen, and no other investigations were necessitated. Chest x-ray revealed an elevated left hemidiaphagm with a smooth contour and a well defined radiolucent shadow in the left chest above the diaphragm along with adjacent plate-like atelectasis . CECT of the chest confirmed diaphragmatic rupture with partial herniation of stomach into left chest. Abdominal CECT revealed minimal free fluid without any visceral injury. About 95% of patients with TDR have associated abdominal or thoracic visceral injury which was not seen in our case. The recommended surgical approach in patients with acute left-sided TDR is laparotomy. Thoracotomy is commonly used in delayed cases to safely separate adhesions between abdominal organs and the thoracic wall. 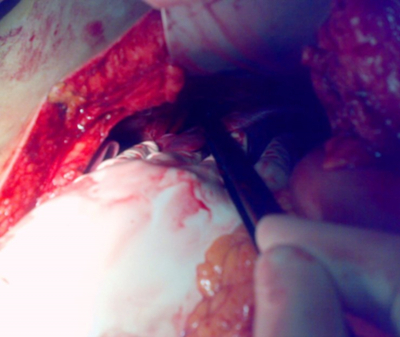 At laparotomy, our patient had a 10cm rent in the left hemidiaphagm extending medially to involve 2cm of the pericardio-diaphragmatic junction with uninjured heart and uninjured other visceral organs in the chest or abdomen. The partially herniated stomach was easily pulled out and the rupture was repaired with interrupted silk sutures. A left intercostal chest tube drain was put in, which was removed two days before the patient was discharged on the seventh day. The patient had no complaints on follow-up. TDR and especially PDR are rare injuries and can be missed in patients sustaining severe blunt thoraco-abdominal injury and having no other indication for urgent surgery . A high index of suspicion with selective radiological evaluation is necessary for early diagnosis. 1. Meyers BF, McCabe CJ: Traumatic diaphragmatic hernia: occult marker of serious injury. Ann Surg; 1993; 218; 783-90. 2. Ball T, McCrory R, Smith JD, Clements JL. Traumatic diaphragmatic hernia: errors in diagnosis. AJR; 1982; 138: 633-637. 3. Mihos P, Potaris K, Gakadis J, et al. : Traumatic rupture of the diaphragm: experience with 65 patients. Injury; 2002; 34: 169-72. 4. Sharma OP: Pericardio-diaphragmatic rupture: five new cases and literature review. J Emerg Med; 1999; 17: 963-8. 5. Fuida G, Brathwaite CE, Rodrignez A, et al. : Blunt traumatic rupture of the heart and pericardium; a ten-year experience. J Trauma; 1989; 31: 167-173. 6. Witkowski Z, Lasek J, Wujtewicz M, et al. : PDR and cardiac herniation after multiple blunt trauma: Diagnostic and therapeutic difficulities. J Thor Cardiovasc Surg; 2005; 130(6): 9-10. 7. McCune RP, Roda CP, Eckert C: Rupture of diaphragm caused by blunt injury. J Trauma; 1976; 16: 531-537. 8. Van Tornout F, Van Luven M, Parry W: Pericardio-diaphragmatic avulsion and concomitant rupture of central tendon of diaphragm. Eur J Cardiothoracic Surg; 2004; 26: 655-7. 9. Galindo Gallego M, Lopez Cambra MJ, et al. : Traumatic rupture of pericardium - case report and review of literature. J Cardiothoracic Surg; 1996; 37: 187-91. 10. Jamal-Eddine H, Chandrasekaran C, Sukumar M. Right sided PDR with complete liver and partial heart herniation after blunt trauma. Kuwait Med J; 2008; 40(2): 153-155. 11. Haeiibrahimglu G, Sotak O, Olemen A, et al. : Management of traumatic diaphragmatic rupture. Surg Today 2004; 34: 111-114. 12. Kutsal T, Ozer M, Alpaslan C, et al. : Traumatic diaphragmatic rupture: look to see. Eur J Cardiothoracic Surg; 2008; 33: 1082-85. 13. 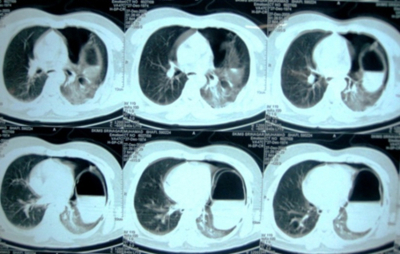 Ringler L, Lavy R, Gayer G: Traumatic rupture of diaphragm: CT diagnosis. Isr Med Assoc J; 2003; 5: 899-900.